Today's transitional period for peer-reviewed journal publishing -- when both the price of subscribing to conventional journals and the price of publishing in open-access journals ("Gold OA") is grossly inflated by obsolete costs and services -- is hardly the time to inflate costs still further by paying peer reviewers. Institutions and funders need to mandate the open-access self-archiving of all published articles first ("Green OA"). This will make subscriptions unsustainable, forcing journals to downsize to providing only peer review, leaving access-provision and archiving to the distributed global network of institutional repositories. The price per submitted paper of managing peer review -- since peers review, and always reviewed for free -- is low, fair, affordable and sustainable, on a no-fault basis (irrespective of whether the paper is accepted or rejected: accepted authors should not have to subsidize the cost of rejected papers). Let's get there first, before contemplating whether we really want to raise that cost yet again, this time by paying peers. If, as rumoured, google builds a platform for depositing unrefereed research papers for “peer-reviewing” via crowd-sourcing, can this create a substitute for classical peer-review or will it merely supplement classical peer review with crowd-sourcing? In classical peer review, an expert (presumably qualified, and definitely answerable), an "action editor," chooses experts (presumably qualified, and definitely answerable), "referees," to evaluate a submitted research paper in terms of correctness, quality, reliability, validity, originality, importance and relevance in order to determine whether it meets the standards of a journal with an established track-record for correctness, reliability, originality, quality, novelty, importance and relevance in a certain field. In each field there is usually a well-known hierarchy of journals, hence a hierarchy of peer-review standards, from the most rigorous and selective journals at the top all the way down to what is sometimes close to a vanity press at the bottom. Researchers use the journals' public track-records for quality standards as a hierarchical filter for deciding in what papers to invest their limited reading time to read, and in what findings to risk investing their even more limited and precious research time to try to use and build upon. Authors' papers are (privately) answerable to the peer-reviewers, the peer-reviewers are (privately) answerable to the editor, and the editor is publicly answerable to users and authors via the journal's name and track-record. Both private and public answerability are fundamental to classical peer review. So is their timing. For the sake of their reputations, many (though not all) authors don't want to make their papers public before they have been vetted and certified for quality by qualified experts. And many (though not all) users do not have the time to read unvetted, uncertified papers, let alone to risk trying to build on unvalidated findings. Nor are researchers eager to self-appoint themselves to peer-review arbitrary papers in their fields, especially when the author is not answerable to anyone for following the freely given crowd-sourced advice (and there is no more assurance that the advice is expert advice rather than idle or ignorant advice than there is any assurance that a paper is worth taking the time to read and review). The problem with classical peer review today is that there is so much research being produced that there are not enough experts with enough time to peer-review it all. So there are huge publication lags (because of delays in finding qualified, willing referees, and getting them to submit their reviews in time) and the quality of peer-review is uneven at the top of the journal hierarchy and minimal lower down, because referees do not take the time to review rigorously. The solution would be obvious if each unrefereed, submitted paper had a reliable tag marking its quality level: Then the scarce expertise and time for rigorous peer review could be reserved for, say, the top 10% or 30% and the rest of the vetting could be left to crowd-sourcing. But the trouble is that papers do not come with a-priori quality tags: Peer review determines the tag. The benchmark today is hence the quality hierarchy of the current, classically peer-reviewed research literature. And the question is whether crowd-sourced peer review could match, exceed, or even come close enough to this benchmark to continue to guide researchers on what is worth reading and safe to trust and use at least as well as they are being guided by classical peer review today. And of course no one knows whether crowd-sourced peer-review, even if it could work, would be scaleable or sustainable. 1. Would all (most? many?) authors be willing to post their unrefereed papers publicly (and in place of submitting them to journals!)? 2. Would all (most? many?) of the posted papers attract referees? competent experts? 4. If any of this actually happens on any scale, will it be sustainable? 5. Would this make the landscape (unrefereed preprints, referee comments, revised postprints) as navigable and useful as classical peer review, or not? My own prediction (based on nearly a quarter century of umpiring both classical peer review and open peer commentary) is that crowdsourcing will provide an excellent supplement to classical peer review but not a substitute for it. Radical implementations will simply end up re-inventing classical peer review, but on a much faster and more efficient PostGutenberg platform. We will not realize this, however, until all of the peer-reviewed literature has first been made open access. And for that it is not sufficient for Google merely to provide a platform for authors to post their unrefereed papers, because most authors don’t even post their refereed papers in their institutional repositories until it is mandated by their institutions and funders. Harnad, S. (1998/2000/2004) The invisible hand of peer review. Nature [online] (1998), Exploit Interactive 5 (2000): and in Shatz, B. (2004) (ed.) Peer Review: A Critical Inquiry. Rowland & Littlefield. Pp. 235-242. Harnad, Stevan (2013) The Postgutenberg Open Access Journal. In, Cope, B and Phillips, A (eds.) The Future of the Academic Journal (2nd edition). Chandos. 4. Because of the Gaussian distribution of virtually all human qualities and quantities, research quality and quality-assessment is not just a 0/1, pass/fail matter. 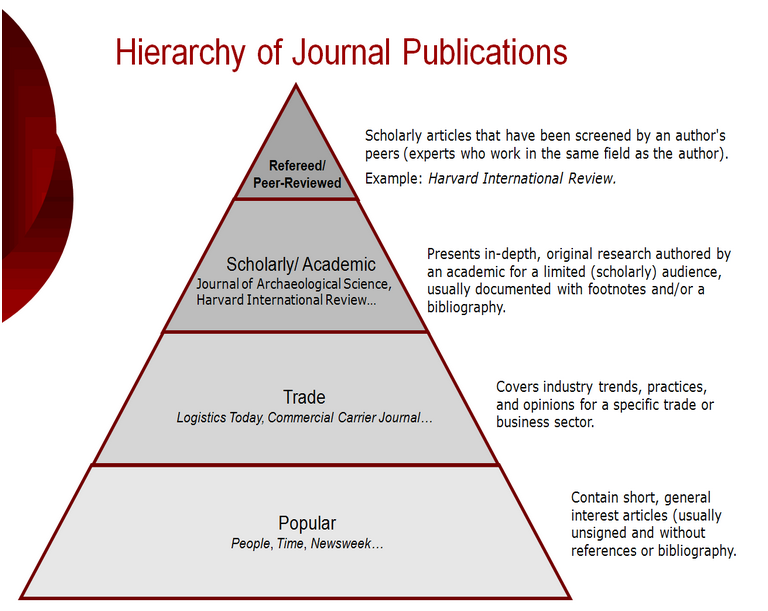 Research and researchers need the much more nuanced and informative hierarchy of quality levels that journals afford. 5. Please don't conflate the simplistic reliance on the journal impact factor (the journal's articles' average citation counts) -- which is not, by the way, an OA issue -- with the much more substantive and important fact that the existing journal hierarchy does represent a vertical array of research quality levels, corresponding to different standards of peer-review rigour and hence selectivity. 7. I think it is exceedingly unrealistic and counterproductive to advise researchers to simply give up the journal with the known and established quality standards and track-record for their work in favour of another journal just for the sake of making their paper Gold OA (let alone for the sake of freeing it from the tyranny of the impact factor) -- and especially at today's still vastly-inflated Gold OA "publishing fee," and whilst the money to pay for it is still locked into institutional subscriptions that cannot be cancelled until/unless those journal articles are accessible in some other way. 8. That other way is cost-free Green OA. And it is global Green OA self-archiving of all journal articles, published in the journal with the highest quality standards the author's work can meet -- not a pre-emptive switch to new journals just because they offer Gold OA today -- that will make those journal articles accessible in the "other way" that (i) solves the accessibility problem immediately, (ii) mitigates the affordability problem immediately, and (iii) eventually induces a transition to Gold OA at a fair and affordable price. 9. Today (i.e., pre-Green-OA), Gold OA means double-pay -- whether for hybrid Gold OA, or for pure Gold OA, as long as subscriptions must still be paid too. "Gold" Open Access (OA) journals (especially high-quality, highly selective ones like PLOS Biology) were a useful proof of principle, but now there are far too many of them, and they are mostly not journals of high quality. Meanwhile, authors have been sluggish about availing themselves of a cost-free way of providing OA for their published journal articles: "Green" OA self-archiving. The simple and natural remedy for the sluggishness -- as well as the premature, low-standard Gold OA -- is now on the horizon: Green OA self-archiving mandates from authors' institutions and funders. Once Green OA prevails globally, we will have the much-needed access to existing journals for all would-be users, not just those whose institutions can afford to subscribe. That will remove all pretensions that the motivation for paying-to-publish in a Gold OA journal is to provide OA (rather than just to get published), since Green OA can be provided by authors by publishing in established journals, with their known track records for quality, and without having to pay extra -- while subscriptions continue to pay the costs of publishing. If and when universal Green OA should eventually make subscriptions unsustainable -- because institutions cancel their subscriptions -- the established journals, with their known track records, can convert to the Gold OA cost-recovery model, downsizing to the provision of peer review alone (since access-provision and archiving will be done by the global network of Green OA Institutional Repositories), with the costs of peer review alone covered out of a fraction of the institutional subscription cancellation savings. I'm preparing a paper on this now, provisionally entitled "No-Fault Refereeing Fees: The Price of Selectivity Need Not Be Access Denied or Delayed."